Another substance important in the body is choline. Although relatively unfamiliar as compared to other known micronutrients, choline plays a very important role in the body. It is almost the same as B-vitamins. It is even often lumped with this vitamin group. Although choline can be produced in the body, it is still important to obtain some of it from food sources. Although no RDA has been established for choline, experts recommend that men over 18-years old should take 550 mg of choline everyday while women who are over 18-years old should take 425 mg of choline everyday. Choline is a structural component of phosphatidylcholine. Phosphatidylcholine is an important compound for cell membranes’ structure. Choline plays a role in the production of neurotransmitter acetylcholine. It also serves as betaine’s antecedent. It has been said that betaine may be useful for cardiovascular disease prevention. Choline protects the liver from fatty build-up. It is also said that choline helps protect the liver from certain kinds of damage, as well as help restore it from damage. Studies conducted which focus on choline are trying to prove whether this nutrient can prevent the loss of memory due to aging and help fight against certain types of cancers. Currently, there has not been conclusive results as to the efficacy of choline in performing these functions. There are a number of foods that are rich sources of choline. Some of these include dairy products, peanuts, liver, iceberg lettuce, eggs, soya and cauliflower. Specifically, pan-fried beef liver (3.5 ounces) contains 418 mg of choline. 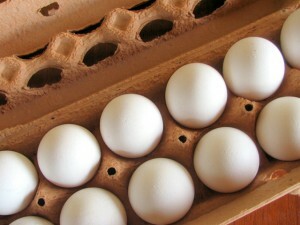 One whole egg (large) contains 112 mg of choline. Ground beef (80 percent lean meat and 20 percent fat) contains 81 mg of choline for every 3.5 ounce patty. Cooked cauliflower (three fourths of a cup) contains 62 mg of choline. One hundred grams of tofu contains 28 mg of choline. Two tablespoons of peanut butter contains 20 mg of choline. Having too much choline in the body can have negative effects. Common symptoms of having too much choline include low blood pressure, a fishy odor in the body and diarrhea. Having a fishy body odor is a condition called trimethylaminuria. This occurs when the body is unable to breakdown trimethylamine, the cause of the fishy odor. Since choline is a precursor to trimethylamine, persons who have a genetic disorder of being unable to breakdown trimethylamine should not take in foods that are high in choline.